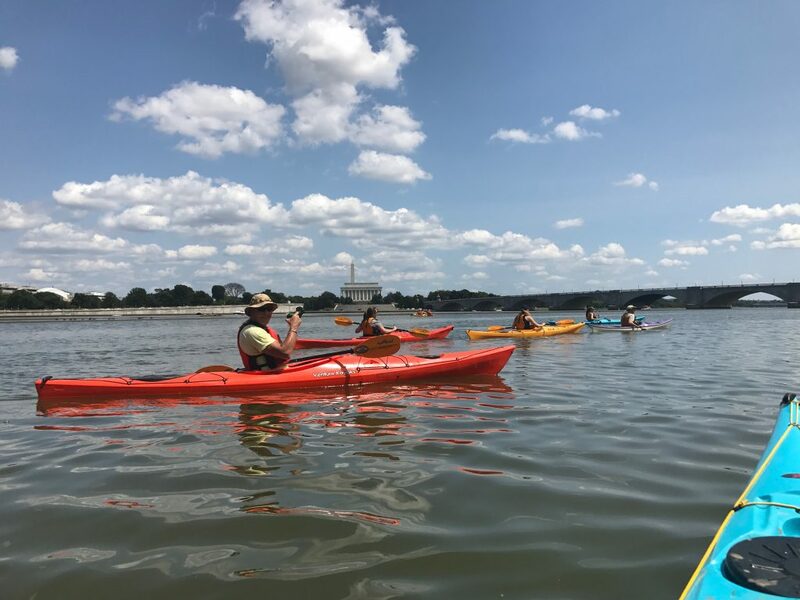 Saturday, August 19th ASHE Chesapeake’s Younger and Young at Heart members took a trip down to DC with Chesapeake Kayak Adventures. The weather was beautiful, it was a great day to be out on the water. The day started with a safety discussion and paddling technique lesson on shore at the Columbia Island Marina. Then, the group of 13 took off and started their adventure at the base of the Pentagon. 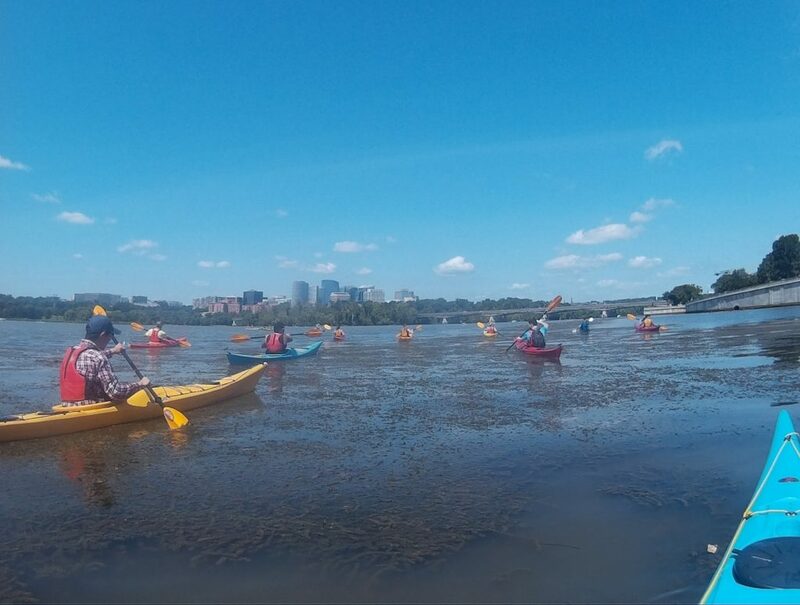 They paddled across the main channel of the Potomac River and headed upstream, passing most of the monuments along the water. 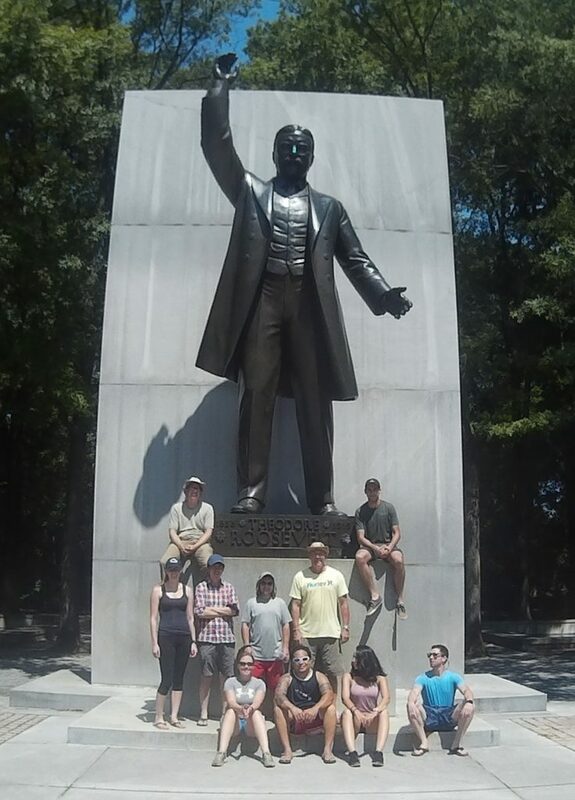 The day continued with sights along the Georgetown Waterfront and stopping for lunch at Roosevelt Island. A small hike on the island led to the Teddy Roosevelt Memorial, which is a beautifully designed plaza consisting of an open granite-paved plaza with fountains and pools, a water-filled moat spanned by foot bridges, 21-foot-hight granite tablets engraved with historic Teddy Roosevelt quotes, and in the center of the plaza, a 17-foot-high bronze statue of Roosevelt. 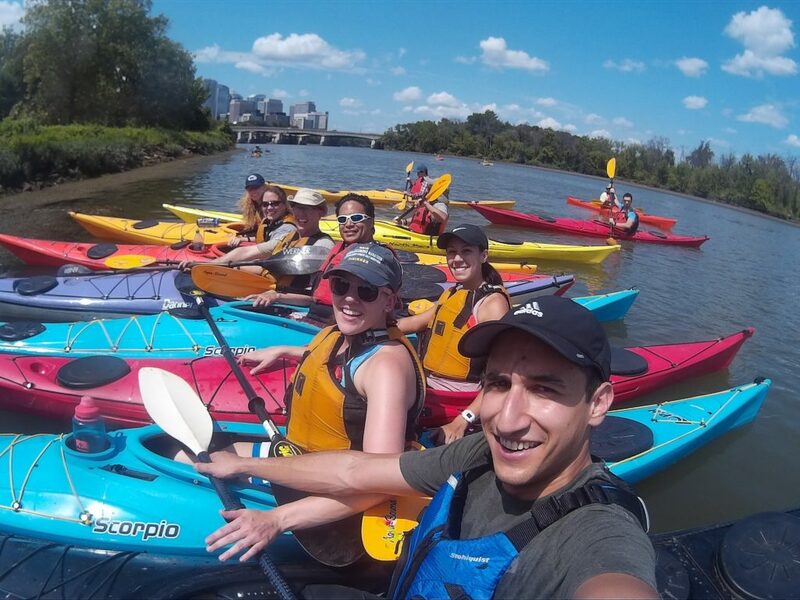 After spending some time exploring the island, the group headed back to the marina, this time paddling on the opposite side of the river to allow for some photo opps! After docking and packing up the gear, drinks and conversations were enjoyed by all while listening to the tunes of the live band playing that evening. This event was one for the books and ASHE YM will look to doing more like this in the future! 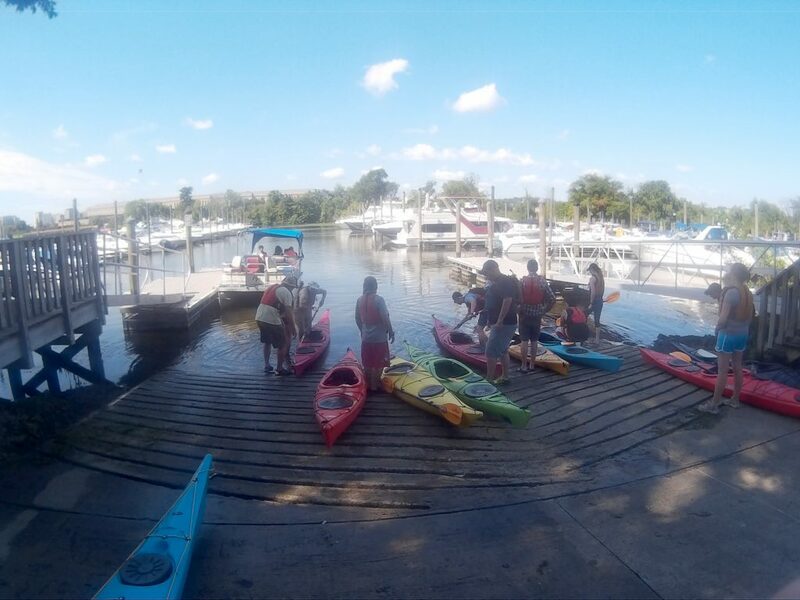 ASHE Chesapeake would like to thank again Chesapeake Kayak Adventures for such an awesome day and also iDesign Engineering for providing Panera Bread lunch packages and helping with the organizing of the event! To stay up to date on all upcoming Younger Member events, be sure to email Amanda Lafleur at Amanda.lafleur@kci.com. The next ASHE Younger Members event (for the young and young-at-heart) will be a guided kayak tour of Marley Creek and several World War I freighters. The group will stop for lunch at Rams Head Dockside (lunch is not included in the event costs). Registration is limited to 20 kayakers, so please register today by sending your RSVP to Amanda Lafleur at amanda.lafleur@kci.com. For more information, click ASHE Younger Member Kayak Tour. Please note that all participants of the kayak tour will need to sign a waiver. A copy is provided at American Kayak Association Adult Waiver form. Please join ASHE for its September 19th construction meeting presented by Mr. Tom Butler. The meeting will include a presentation of the Ellicott City flood emergency response and recovery efforts followed by a walking tour of the Ellicott City reconstruction progress. Meet at the Ellicott/Columbia Room, George Howard Building, 3430 Court House Drive, Ellicott City, MD 21043, where Tom Butler will present an overview of the efforts over the last year to reconstruct Old Ellicott City. Mr. Butler is the Deputy Director of Howard County DPW, Engineering, Development and Construction. Presentation attendees will be shuttled to Parking Lot F at the intersection of Ellicott Mills Road and Main Street, where the walking tour will begin. Attendees are invited to happy hour at La Palapas afterwards. The bus will return everyone parked at the George Howard Building (3430 Court House Drive, Ellicott City, MD 21043) after the tour. Participants can then move to the parking areas along Main Street and join the crowd for happy hour. RSVP: This event is limited to 30 attendees. Registration will be first come, first served. Cost is $30 for ASHE members and $40 for non-members.